In an article, “New state hospital may close,” published in the Bulletin of the Salem’s Central Oregon region, the Associated Press reported December 3, 2016, that Oregon’s Governor Kate Brown had suggested she had decided or was in the process of deciding to close a new state psychiatric hospital, in the Eugene, OR area, near Junction City. which is the new site of the original Oregon State Hospital.This hospital has a total capacity of 100 beds. 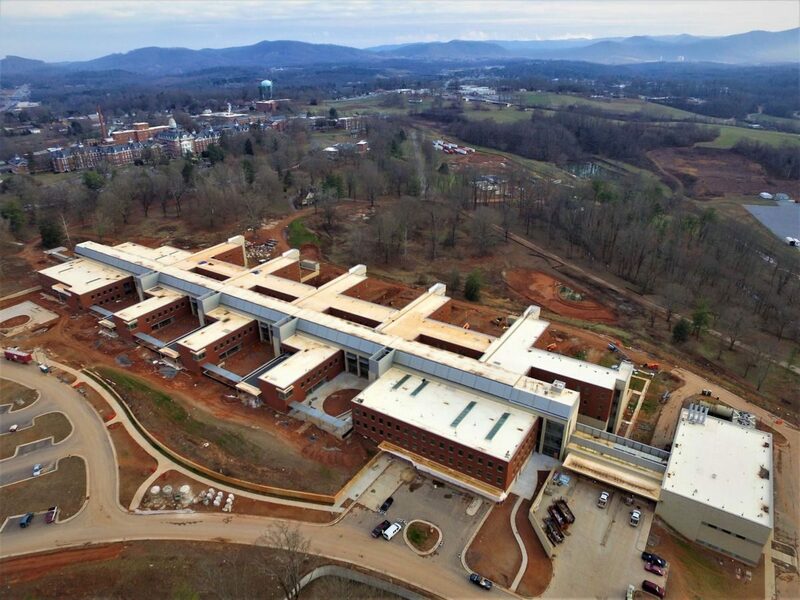 The hospital which has been open only 18 months and cost $130M to build, is slated for possible/probable closure in mid-2018. Its closure was heralded as necessary to save the economically beleaguered state much-needed monies. No real details are given by the state personnel’s’ announcement concerning this drastic move except there is a large budgetary “hole” in the state’s health care departments’ budgets and closing the hospital, which has 422 employees will save the state $34.5M a year. Author FrankPosted on October 28, 2016 Categories private psychiatric hospitals, privatization, state hospitalsTags California, for profitLeave a comment on Is Privatization of State Hospitals A Viable Solution? Ms. Megan Hart of the Kansas Public Radio Station KCUR and the group Heartland Health Monitor partner KHI News Service has been following and chronicling the long sad story of the Osawatomie State Hospital in Kansas for quite some time now, nearly two years or perhaps longer, that this writer has been aware. Ms. Hart’s latest article, “Osawatomie State Hospital: A Leading Light for Mental Health Care Slowly Dims.” published July 25, 2016 documents very ably both the issues of this state hospital, its parent state, and the social vise that all too many such state hospitals more or less find themselves facing in this time of hoped for reform.This piece of American state hospital history is in many ways not unique to the fascinating and very checkered social history of the American state psychiatric hospital for public inpatient care of the seriously and chronically mentally ill.
Just yesterday I wrote briefly of the contrasts between New Hampshire and Vermont who face difficult state wide mental health service care delivery tasks. Today I feel I have to return to a story, or rather a sad saga, of Central State Hospital in Virginia. Virginia since the tragedy of State Senator Craige Deeds’ son Gus who was variously reported as bipolar or schizophrenia, committed suicide two years ago. The circumstances were unbelievably tragic, sad and preventable if, in my view, public and/or private psychiatric inpatient facilities had done their duty [more on that rant later below]. In brief summary, young Gus was in his very early 20’s and had been repetitively psychotically mentally ill for a few years illustrating the typical early adult onset of these illnesses, especially schizophrenia. He became psychotic again and stabbed his father. He was taken by his father to a nearby hospital ER, a hospital without a psychiatric inpatient unit. He was held in the ER for some period of time [the reports vary from hours to a few days]. He had to be released under less than clear circumstances because a bed could not be found for him in ANY psychiatric inpatient unit in the state, which to me is the first bad tip off in this saga. He very shortly thereafter, while apparently still quite symptomatic and actively ill, suicided. As is well known, his father Sen. Deeds has thrown his considerable talents, knowledge, energies and influence into crafting exemplary legislation in Virginia to correct many cracks and deficiencies in their combined state system of psychiatric care. Of note is the lingering issue that his bill is still not law in Virginia. Now to the current unfolding tale of woe, and goodness knows what else that is week by week it seems, unfolding out of Virginia’s Central State Hospital. 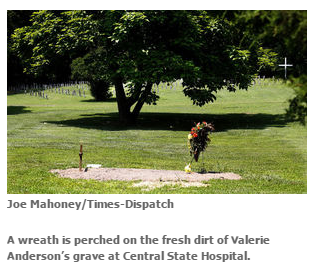 There have been a series of near damning articles in multiple minor and major newspapers in Virginia detailing the trial of failures it appears that resulted in the death of a woman named Valerie Anderson now buried on the campus of Central State Hospital since she died there. The intrepid reporters for the Times-Dispatch, then armed with the scant information they were able to gain from their Freedom of Information suit, did gumshoe, old-fashioned journalistic ‘detective work.’ and examined Newport News court records, found the record of a Valerie Anderson trespassing charge. And of things in the newspaper “morgue file,” as they used to be called, they found a sticky note marked “Important,” that gave the date of May 25 as her transfer/admission to Central State, and of May 26 as the date of her death. As it turns out Virginia DOES have good state laws and mandatory procedures for handling patient deaths in state institutions of any kind and they are detailed quite objectively in the above-cited article.There are well-defined time frames in which certain steps must be taken in order and that the steps must go up the state government’s chain of command in a certain order to the highest levels. But the article’s description of the halting effort the hospital made in its description of the events and refusals and declinations to give information makes for sad but also infuriating reading. To make matters worse, the family was rebuffed initially in their efforts to gain information regarding the fate of their mother. This makes for tough reading as the article details the obfuscating and self-justifying responses of the officials that were contacted. I will end this story with a final slightly lengthy quote which I think emodies the then attitude of the protective state functionaries [a kinder word than I think the families or reporters would use] who were in a position to help the family and reporters: “Anderson had a personal Facebook page and was online frieds with her four children. But social media sites and internet search engines are not part of the process state workers use to locate family members [I would ask WHY NOT?] when someone dies in custody, according to Maria Reppas, spokeswoman for the Virigina Department of Behavioral health and Developmental Serivces…The facility does not take steps such as conducting Google searches or looking through Facebook sites to locate next of kind nor is it required to do so,” Reppas said in a email. After the family learned through the newspapers’ reporters that their mother was indeed deceased and had been buried in the hospital cemetery, the daughter Jacqueline asked to visit her mother’s gravesite. The article states at its end that she was told she would have to make an appointment to do so. I became aware of Bridgewater State Hospital during my college and medical school years in Ann Arbor, Michigan through two events in my student life back then. After I finished medical school, I was fortunate enough to land a six-month externship in forensic psychiatry at the Center for Forensic Psychiatry located on the grounds of Ypsilanti State Hospital south of Ann Arbor. This was a state hospital that had become famous in its own right. 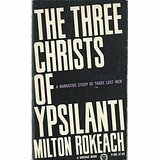 It was the subject and setting of a famous book, The Three Christs of Ypsilanti, by Milton Rokeach. The book was ahead of its time, portraying the irony of three psychotic inpatients who shared a unit as well as the common delusion that each was Christ. The book was hit for years and required reading almost in every university in first-year classes in psychology. I had read the book as well and was fascinated by the premise of how these patients handled the dilemma of their common and contradictory claims. Little did I know that my externship would bring me into contact with the late forensic psychiatrist, Dr. Ames Robey. Dr. Robey astutely had realized and discovered the identity of the “Boston Strangler” as one of the psychiatric inpatients at Bridgewater, Albert DiSalvo. This brought Dr. Robey national fame and publicity though he had no interests in all media attention. As an aside, I also was able to work under Dr. Elissa Benedek MD, an early female forensic psychiatrist, who was also a child psychiatrist, and a few years later, became President of the American Academy of Child and Adolescent Psychiatry. She was a small bespectacled woman, calm, supportive and incredible teacher, and clinician. So, these two experiences acquainted me serendipitously with Bridgewater State Hospital. Late last year, Bridgewater State hit the headlines again as stories of abuse, poor treatment, a group of deaths of three men in 2015 were reported in the Boston media. Within months, three guards at the facility were indicted of involuntary manslaughter and the Boston Globe had a documentary series of articles on the all too familiar, decades-old tale of sandals and substandard levels of care. I had actually assumed that Bridgewater State, by this time, had long been closed. Silly me. Like so many state psychiatric facilities, it was very much needed and like an old battleship kept in service for decades. The news about the hospital by April of this year just kept getting worse. To me, it was like somehow seeing an eerie reprise of the movie “Titicut Follies.” That goofy and weird feeling kept me following the news stories that have emerged in the last two months in the Boston Globe newspaper. How did this hideous story come to be repeated nearly 45 years later? The Boston Globe reported on the slowly evolving, yet almost inevitable conditions that brought this tragic replay back to life in an article in April 2016, this past month at the time of this writing. The usual culprits of legislative neglect through decades of inadequate funding, lack of oversight and installation of a poor level of care, and a herculean task demanded of an institution not properly fueled for its job.